Although jobs can be hard to come by nowadays, people are still quitting their jobs. According to an article from Business Insider, the number one reason Generation X workers leave their jobs is because they don’t trust the corporations they work for. Like in any relationship, trust is key. But what about those employees who decide to stay? What are the reasons workers decide to stick it out and remain at a job for 10, 20 or even 30 years? Below are seven of the most common ‘stay factors’ when it comes to whether or not a worker will leave a job, areas to assess to make sure you’re retaining workers in your own company. This is usually the biggest reason someone once considering switching jobs will decide to stay. Everyone enjoys getting extra money and, often, low wages are what push employees to seek new employment. This is especially helpful for the people who truly enjoy the work they do, but their salaries weren’t enough to cover daily expenses. Studies have shown how important flexibility is for today’s worker, especially women. Providing flexible options for workers is another major reason people tend to stay in their current position. Sometimes the typical 9am to 5pm schedule doesn’t work for everyone. Changing schedule hours, for example 10-hour-shifts for four days a week, adding a work-from-home option and/or being flexible with an employee’s start and stop times makes a worker more prone to continue working for their current company as opposed to finding a more flexible employer. Having the ability to be your own boss and have free reign comes in handy. Many workers like to do things in their own way; the hands-off approach is a must in the workplace. Those who have a certain level of independence are more apt to stay in their current positions because they’re not restricted, they don’t have boundaries and/or they’re able to work at their own pace and in their own order. This may seem trivial, but you’d be surprised what a new office can get you. A lot of employees may enjoy the actual work they do, but not the space they’re forced to do it in. An upgrade to a larger office, an office with a window, an office with a nice view, or (for some) any type of office itself can go a long way in keeping employees content. Some workers don’t have a work space to call their own. Having a set space or office can mean a lot for workers because it helps them become comfortable and relaxed as they personalize their working area. Many workers are either in or going back to school. Providing the option of funding a worker’s education (when it benefits the company) is a surefire way to keep employees on board. Getting a higher education is extremely expensive; so, the fact that a worker’s employer will foot the bill is a definite reason to stay with the company. As stated before, most Generation X workers resign because they don’t trust the corporations they’re working for. 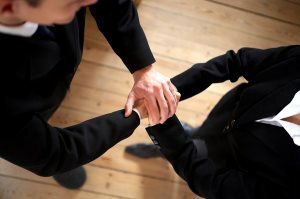 Trust is huge in the employer-employee relationship. Employers have to trust that you as a worker will effectively perform the tasks required of you; they need to know that you’ll benefit the company for the money they’re paying you. Employees need to trust in the stability and security of an employer. They need to know that the company will provide them with the necessary tools to get the job done, provide professional development so they can advance in their careers and keep the business running so they will receive that much needed paycheck. If the trust is absent on either side, it’ll make for a strained relationship, which eventually results in ties being severed. The fact that employees trust and have confidence in the people who run the company and their direct managers is extremely important when it comes to employee retention. A final reason why employees tend to stay at a job is because of the environment they work in. I’ve worked at many jobs where I simply enjoyed the culture of the company from the workers to the managers to how the company engaged employees and the community. If the worker feels like he or she belongs, like the individual is truly a part of the team, this will play a major role in him or her working at a company. If an employee feels disconnected or doesn’t like the company’s culture, it will be easier for him or her to leave.